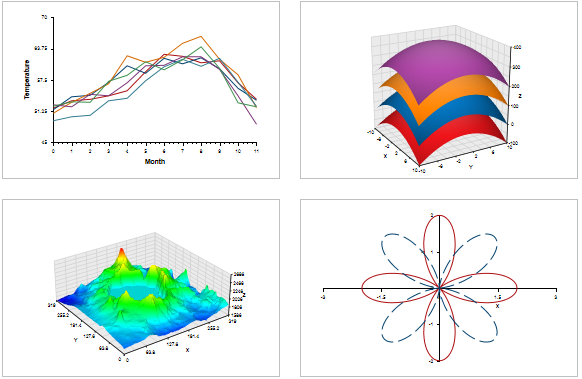 TeraPlot LT brings powerful 2D and 3D graphing to a Windows Store app. Using TeraPlot LT, you can create line plots and surface plots in various coordinate systems, based on either mathematical expressions or data. In addition to producing great looking graphs, TeraPlot LT also provides a host of features to aid storage, layout, and export. A TeraPlot LT project can consist of multiple pages, with each page storing up to 16 graphs. Pages can be added, deleted and rearranged, and graphs can be cut and pasted within and between pages, and also be rearranged within a page. Graphs can also be copied to the clipboard as images, saved to an image file, shared via the Share charm, and printed. TeraPlot LT is free to use, but an in-app purchase is required if you wish to save project files. Create multi-page projects containing your graphs. Use different row/column layouts on each page. Cut/paste graphs within a page and between pages. Customize graph colors (background, axis lines, axis labels, etc.). Export graphs as images to a file or the clipboard. Specify graph axis tick positioning and labelling. Add graph annotation in the form of captions, color keys, legends. Zoom, pan, and animate 3D graphs. Create cartesian, polar, or parametric 2D plots with various line style options. Help us improve TeraPlot LT by giving us your feedback. If there are any features you'd like to see included, or you have any problems to report, let us know by contacting us at: LTSupport@TeraPlot.com. Additionally, you can share your opinions of the app by reviewing it on the app's download page on the Windows Store.